Season 3, Episode 57 - Caitlin Canty Dan Sterenchuk and Tommy Estlund are honored to have as our guest, Caitlin Canty. 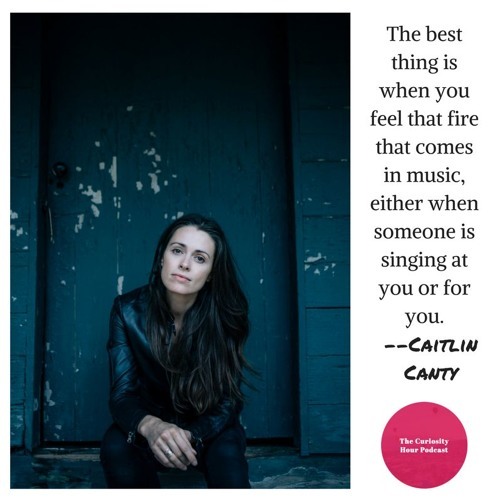 Caitlin Canty is an American singer/songwriter whose music carves a line through folk, blues, and country ballads. Her voice was called “casually devastating” by the San Francisco Chronicle and NPR describes her songs as having a “haunting urgency.” Motel Bouquet, Canty’s third record, features ten original songs that hold her darkly radiant voice firmly in the spotlight. Produced by Grammy-nominated Noam Pikelny (Punch Brothers) and recorded live over three days in Nashville, the album boasts a band of some of finest musicians in roots music, including fiddler Stuart Duncan and vocalist Aoife O’Donovan. Rolling Stone hails Motel Bouquet as “dreamy and daring” with “poetic lyrics and haunting melodies.” Since the release of her critically-acclaimed Reckless Skyline in 2015, Canty has put thousands of miles on her songs, circling through the U.S. and Europe. She warmed up stages for The Milk Carton Kids and Gregory Alan Isakov and recorded with longtime collaborators Darlingside and with Down Like Silver, her duo with Peter Bradley Adams. She won the Troubadour songwriting competition at the Telluride Bluegrass Festival, and her song, “Get Up,” was nominated for Song of the Year in the Folk Alliance International Music Awards. Canty’s original recordings have recently appeared on CBS’s Code Black and on the Netflix original series House of Cards. Raised in small-town Vermont, the daughter of a school teacher and a house painter, Canty earned her degree in biology in the Berkshires and subsequently moved to New York City. She spent her days in the city working as an environmental sustainability consultant and her nights making music at Lower East Side music halls and bars. In 2009, she quit her job and set out to make music full time. In 2015, she packed up her house plants and her 1939 Recording King guitar and drove to Nashville, TN, which she now calls home. Motel Bouquet available at PledgeMusic: https://www.pledgemusic.com/projects/caitlincanty Caitlin's website: https://www.caitlincanty.com Note: guests create their own bio description for each episode. The Curiosity Hour Podcast is hosted and produced by Dan Sterenchuk and Tommy Estlund. Please visit our website for more information: thecuriosityhourpodcast.com Please visit this page for information where you can listen to our podcast: thecuriosityhourpodcast.com/listen/ If you would like to share your story or have a suggested guest, please complete the "Contact us" form: thecuriosityhourpodcast.com/contact-us/ Disclaimers: The Curiosity Hour Podcast may contain content not suitable for all audiences. Listener discretion advised. The views and opinions expressed by the guests on this podcast are solely those of the guest(s). These views and opinions do not necessarily represent those of The Curiosity Hour Podcast. This podcast may contain explicit language.